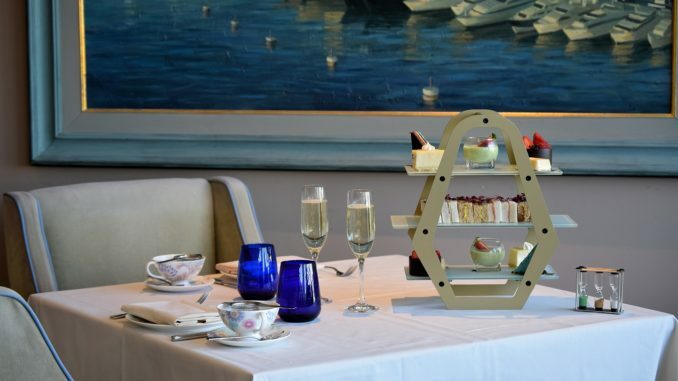 March saw the launch of a brand-new ‘Travel Through Time’ afternoon tea in partnership with Whittard of Chelsea at the five-star all-suite Chelsea Harbour Hotel and I went along to try it out on a recent sunny afternoon overlooking the yachts moored in a peaceful Chelsea Harbour Marina. Whilst I arrived fashionably late, thanks to yet more signalling problems at London Bridge, luckily my guest, who arrived on time, was able to wait for me sipping on a glass of champagne in the comfort of the Chelsea Riverside Brasserie, which is where afternoon tea is served. Whilst a few braved the terrace, it was still early April and not warm enough yet to enjoy an alfresco afternoon tea. 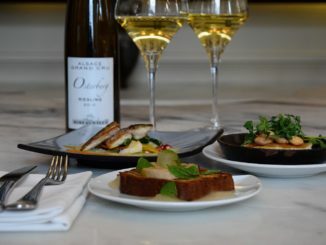 We were looked after superbly by the attentive staff and a second glass of champagne soon appeared after I arrived so that we could peruse the menu and tea selection in a more relaxed state after my frustrating journey. The setting could not be more idyllic for de-stressing, far away from the bustle of London Bridge Station and delayed trains. 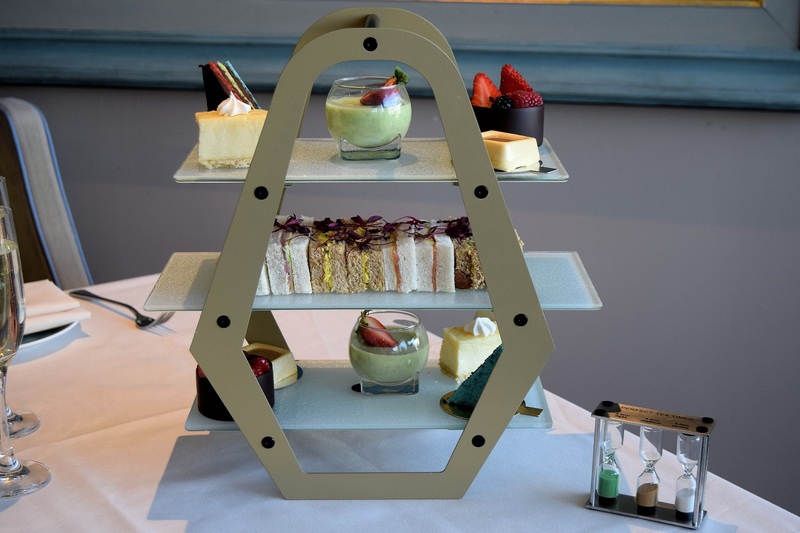 As the name implies, this is a rather different afternoon tea designed to represent a time machine, taking guests on a journey through the history of the afternoon tea, which was invented by the Duchess of Bedford back in 1840, right through to the present day. It even sits on a special bespoke stand and dry ice for a more authentic experience, magically transporting us back first to the early 1700s when John Montagu, the fourth Earl of Sandwich invented the sandwich as a snack whilst playing cards. We are then transported to the mid-1700s to witness the East India Company deliver large quantities of tea from India and thereby making tea grow in popularity in England. Out next time leap takes us to 1840 when Anne Russell, the seventh Duchess of Bedford officially introduces the concept of “Afternoon Tea” when dinner is changed from early evening to late evening. It is then not until 1865 that the First Hotel in London serves afternoon tea to its guests. We then jump to 1946 when George Orwell publishes “A Nice Cup Of Tea”, giving us the 11 golden rules to making the perfect cup of tea. It was actually not so long ago, in 1970 in fact, when the addition of milk to tea becomes popular for the first time. Our penultimate leap in time takes us to 2017 where we learn that the UK is estimated to have consumed a staggering 6.2 Billion cups of tea! 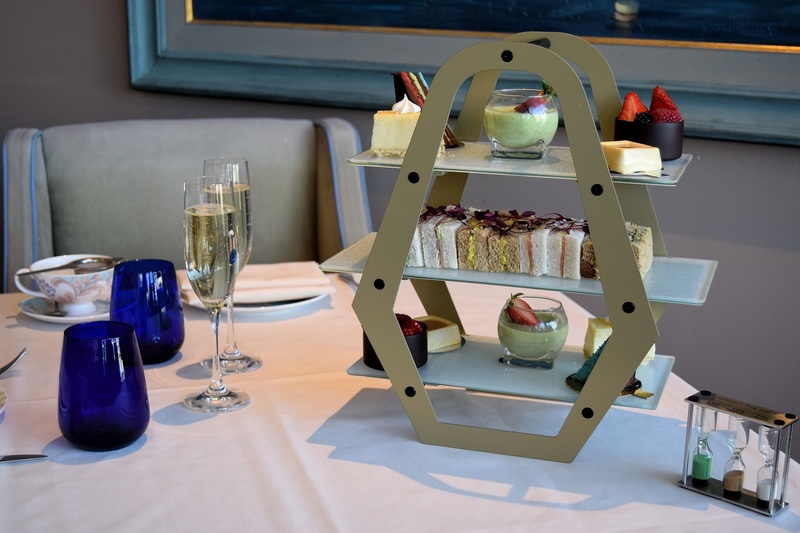 Our final journey transports us back to our table at The Chelsea Harbour hotel in 2018 where we take a look at the tea selection that is on offer today. For the tea aficionados amongst you, there is a choice of Jasmine Dragon Pearl, as it was China that gave tea to the world as far back as 300BC. Genmaicha to celebrate tea appearing in Japan in the ninth century, brought in from China by Buddhist monks and representing the strong tea culture in the country. 1886 is an historic blend inspired by the style of tea that was popular in Europe and the year Walter Whittard opened his first shop in Fleet Street. 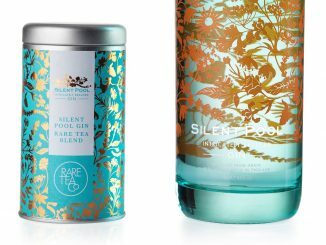 The Chelsea Flower Show has been held in Chelsea since 1912 and so the Chelsea Garden is a light white tea with rose buds and summer fruits. Any afternoon tea would not be complete without Darjeeling being featured on the menu as it was in the late 19th century that India started mass cultivation to help make tea the global product it is today. Extravagant Earl Grey represents the spread of tea drinking in Europe during the 18th and 19th centuries whilst Vanilla Honeybush is a nod to tea growth in Africa and in particular Kenya and Malawi. This is a full-bodied infusion similar to Rooibos but with its own unique character. 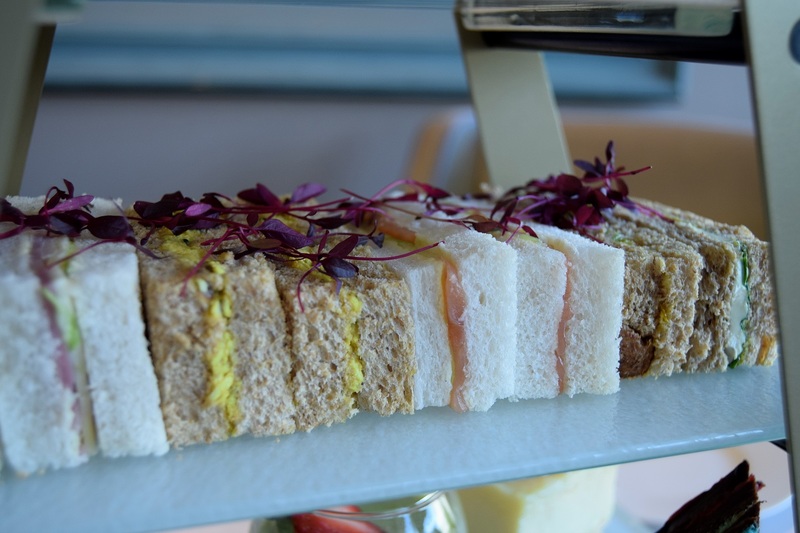 Having chosen our teas, it was time to indulge in some delicious freshly made finger sandwiches filled with classic and contemporary delights such as Salmon and Cucumber, a modern twist on the quintessential cucumber sandwich created in the 1700s by John Montagu the fourth Earl of Sandwich. The Coronation Chicken sandwich was created in 1953 specifically for Queen Elizabeth II’s coronation, whilst the Brie and Purple Piccalilli is a quirky take on the classic British teatime treat. Any selection would not be complete without a classic Ham and Cheese sandwich, which seems to date back to 1923. Our journey through time theme continues with a tantalising naughty but nice selection of cakes and desserts, such as the Flummery, which is a traditional jelly-like dessert made from oatmeal and originating from 1623 with a delicious rhubarb twist. 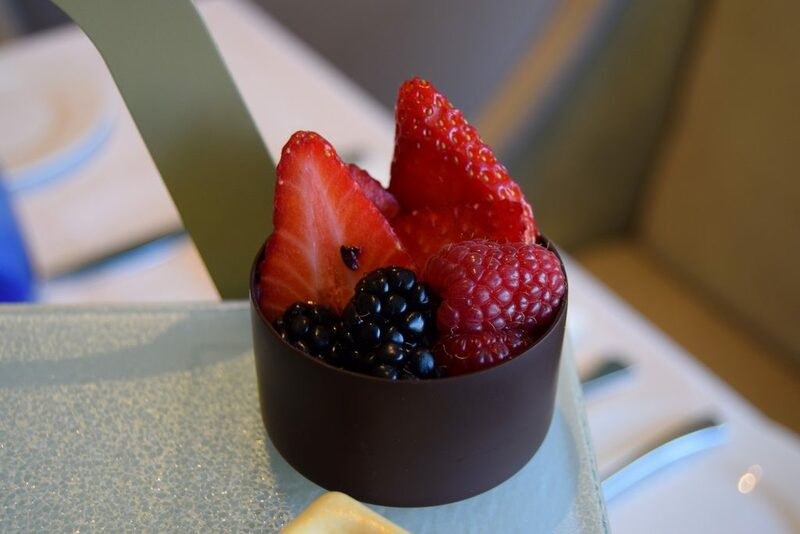 The Passion Fruit and Berry Egg is a creamy passionfruit mousse topped with a seasonal berry selection and inspired by the legendary 1885 Fabergé Egg. 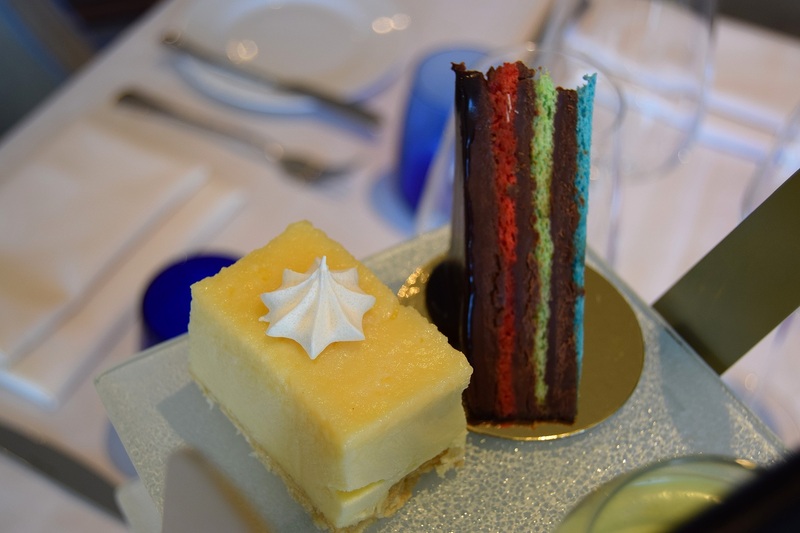 The colourful Chocolate Rainbow Cake is fashioned in the shape of the gnomon of a sundial pointing to four o’clock, the traditional time to have afternoon tea, whilst the Pear and Caramel Mousse is paying homage to the world’s oldest cultivated and beloved fruit. And finally, the good old Lemon Tart puts in an appearance. The earliest known mention of the tart was in 1897 in a Dorset village, when it was apparently entered into a family cookbook. The creamy classic recipe we have come to love is a far cry from the original tart made from boiled lemon and sugar. 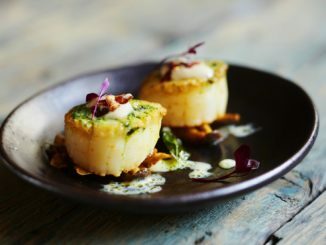 Chelsea is not the easiest of places to get to but this rather unique afternoon tea in such a beautiful setting is well worth the journey to get here so you can get to experience an altogether different journey through time. And so it was some two hours later and well fed, that we finally bid adieu to the friendly staff and embarked upon our journey back on London’s Overground to our next destination. 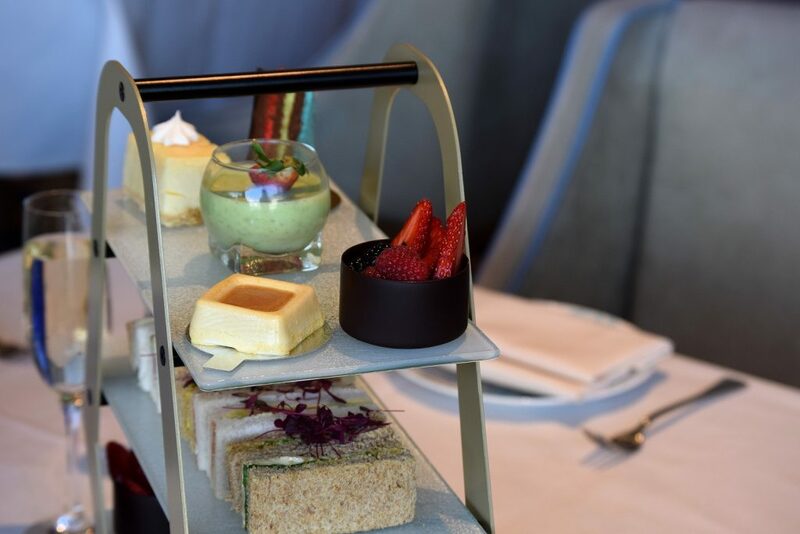 The Travel Through Time Afternoon Tea at The Chelsea Harbour Hotel costs £28 per person, or £38 with a glass of champagne and is available Monday to Sunday from midday to 4:00pm. The hotel is located in the heart of Chelsea and just 0.2 miles and a 5-minute walk from Imperial Wharf Station on the London Overground.